The opera Emperor of Atlantis was written in 1943 in Theresienstadt, the concentration camp set up to fool Red Cross inspectors into thinking the camps were fun, happy places where life and art flourished. 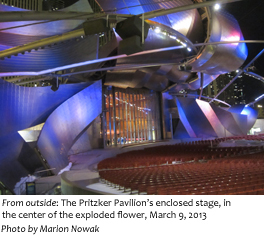 Last night we saw a rare performance of this one-hour opera at the Pritzker Pavilion in Millennium Park. As I told my FB friends, attendance was FREE, and we got the thrill of sitting on the stage during the performance. Emperor of Atlantis made it as far as rehearsals before the Nazis decided it mocked Hitler. They cancelled the performance. They sent its composer, Viktor Ullman, to Auschwitz and killed him in the gas chamber; everyone else involved in the production – singers, musicians, the librettist Peter Kien – was also slain. But the sheets and scraps of paper on which Emperor of Atlantis had been written happened to survive, preserved by the camp librarian. Hitler, I believe, not only killed six million Jews, some of them my relatives, but killed the heart of European culture. So, last night, on the stage of one of the world’s most wonderful performance spaces, watching these glorious musicians, my thoughts were, shall we say, bittersweet. So much was destroyed. We angrily regret the censored, murdered voices – all the censored, murdered voices. Yet this sharp, funny, sweet, anguished, powerful piece survives and, as art always does, reminds us, in its own clear voice: remember ever-present “Death, the Gardener,” and live the one life you have. By the way, there is one more performance of this beautiful opera, tonight at 5. This is one hour you will always be glad of. Find out more here. Write to Dominic Johnson (mrdominicjohnson@gmail.com) to RSVP for your free ticket, and go. 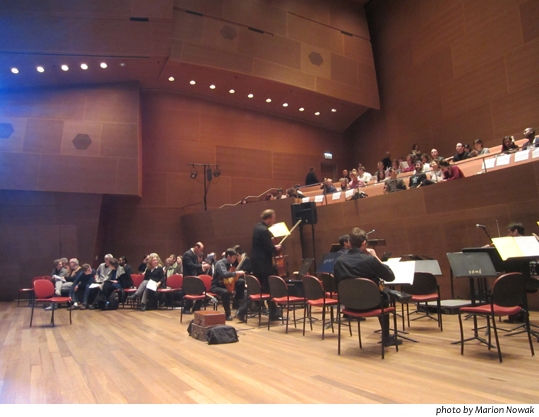 This entry was posted in Uncategorized and tagged Emperor of Atlantis, New Millennium Orchestra, Pritzker Pavilion Chicago, Viktor Ullman. Bookmark the permalink. A moving post inspired by a moving event. Amazing that this artistic work got to live on. Thanks, 9591 Iris.